NYC Police Chief Calls Inspector General's Critical Report 'Grandstanding' Commissioner William Bratton issued new guidance on the use of force by officers. The changes were announced the same day the NYPD inspector general issued a report taking the department to task. New York Police Department Commissioner William J. Bratton speaks at a news conference on Sept. 16 in New York City. 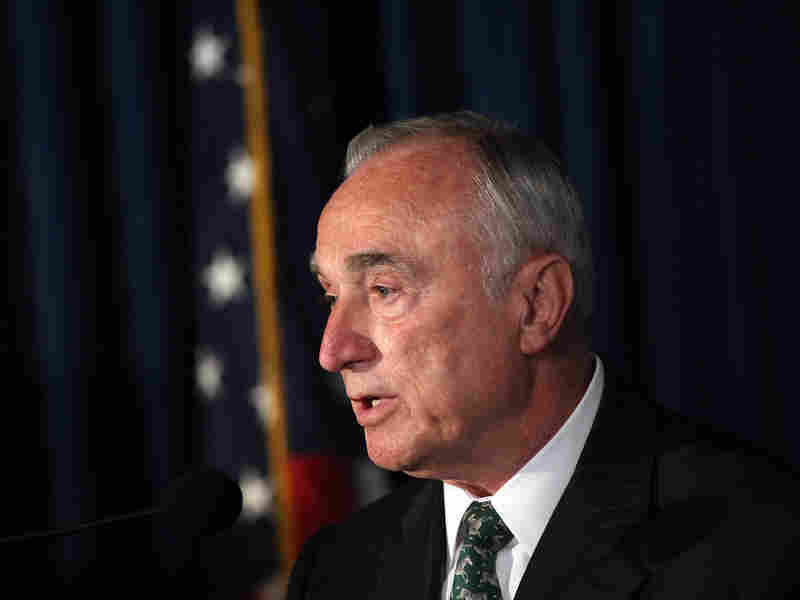 Bratton announced sweeping changes to the department's use-of-force policy on Thursday. The largest police department in the country is changing the way it deals with the use of force by its officers. New York City Police Commissioner William Bratton issued the new guidance on Thursday, changing the way that officers will be trained in using force, the way that use-of-force incidents will be documented and the way officers will be disciplined for using or witnessing — and failing to report — excessive force. The new system will take effect in early January. The changes were announced the same day that the NYPD inspector general took the department to task for not doing enough to train officers to de-escalate potentially violent situations. In a report that examined 179 substantiated cases between 2010 and 2014, the IG states that the department doesn't adequately track use-of-force incidents or discipline officers who use excessive force. The report also found blacks and Hispanics were disproportionately the victims of excessive force. In an interview with Commissioner Bratton, NPR's Steve Inskeep pointed to one of several incidents outlined in the report, in which an officer punched a suspect in the face four times and then pulled his legs out from under him after he refused to show identification. A fellow officer looks on, only intervening when the officer continues to strike the man after he's fallen to the ground. "That was grandstanding on the part of the inspector general's report," Bratton tells NPR. "They were basically seeking to get the most newsworthy [cases], if you will," he said, adding that the inspector general was aware that he has been in the process of overhauling the department's approach to the use of force since returning to the department last year. "They evaluated something that was in progress because it allowed them to make statements like the one you described, saying that we're not doing enough to do de-escalation," he said. I think it's vitally important for a variety of reasons: one, public trust, the idea of knowing what we're doing in that vital area; two, identification of officers that may be problematic; three, in our case, what we have put into place will also document uses of force against our officers — a growing problem, I believe, in the United States, particularly over the last several years. So, the idea is to get a total picture. Also, by documenting uses of force against our officers, we might also identify officers that have a larger number of those types of instances, also. The NYPD, for, oh, over 40 years, has documented extensively incidents of shootings by police officers. And we reported yesterday, also, that we had 79 of those incidents in 2014, the lowest number ever since we started documenting them back in the 1970s. The reality of policing is that we have policies and procedures. We train to them. We supervise them when we put them in place. These policies will go into effect just after the first of the year to give us time to begin the training process that's necessary. These are very comprehensive. We've had policies scattered all over our very large patrol guide. They've now been brought into one chapter of our patrol guide. Very importantly, they not only tell officers what not to do, but as importantly, for the first time, tell them what to do. So, I'm very optimistic that we'll overcome any opposition, if you may. That was grandstanding on the part of the inspector general's report. The report covered a period of time: 2010 to 2014. I became commissioner in 2014. They picked ... 174 out of 10,000 cases. So, they were basically seeking to get the most newsworthy, if you will. The report did not take into account adequately, sufficiently, the fact that this change has been underway for the last year and a half, since I became police commissioner. So, what we announced yesterday was not in response to the inspector general report. The problem with the inspector general's report was that they did not wait until we finished our study, announced our changes and then done the evaluation. Instead they evaluated something that was in progress because it allowed them to make statements like the one you described, saying that we're not doing enough to do de-escalation. We just put into place one of the most extensive in-service training programs in America, where every officer every year will be trained for five days — one full week. Two days on firearm training, which has clearly resulted in the statistic I just gave you: only 79 shootings involving a department with 5,000 police officers in America's largest city.